We returned for Afropunk Brooklyn 2016 and this year was better than ever! I loved connecting with all the people who discovered our brand for the first time and the jewels who returned and remember us from last year. Leading up to Afropunk I was super nervous, even more than the first time I was selected from hundreds of applicants to be a vendor. This year my expectations were much higher because I wanted to improve from my freshman year and perfect my festival pop-up. The love and energy was overwhelming and my main focus was engaging with everyone that stopped by the booth. I enlisted my best friend and girlboss wedding and event planner Michelle to keep me as sane and organized like she does her brides on their big day. The most popular pieces were our "Commitment Issues" nose cuff, "Boundless" Choker, "Perpetual" wrap necklace and "Venus" Body chain. By the end of day 1 most of the top sellers were sold out. 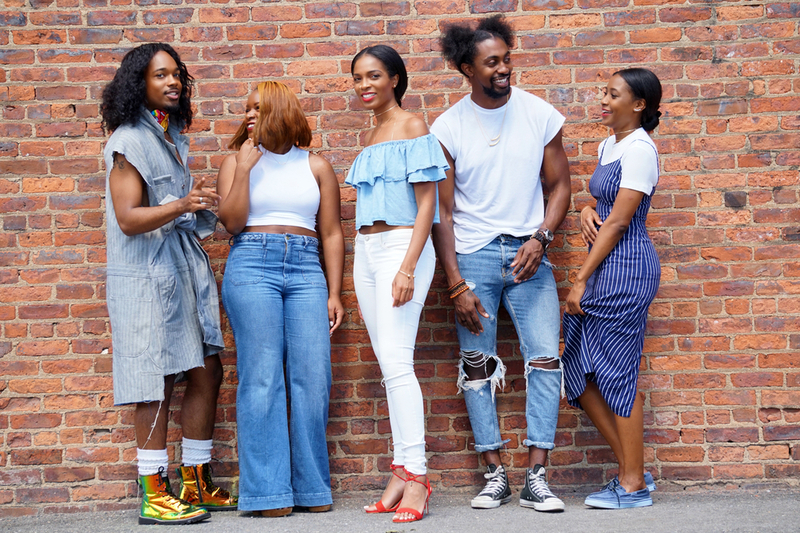 Afropunk is more than a festival it is a collective of individuals overflowing with creativity and self-love. The #BlackGirlMagic, #MelaninMagic, #CareFreeBlackGirl, #_____ add any collective self-love hashtag and chances are it's on full display and I'm here for all of it. One of my favorite things to do is venturing away from the booth to check out all the dope looks. This year everyone came with their fashion A game. In my opinion the fashion at Afropunk rivals that of fashion week and lets be honest the majority of designers draw inspirations from street style and events like Afropunk. This year their was no shortage of inspiration. I missed most of the performers but had the chance to watch Ceelo and Ice Cube. They were amazing! Next year I'm posting "I'll be back in 20 minutes" sign so I can catch so more performances lol. Thank you to everyone that stopped by to say hi and shop with us! Welcome to the Made by Malyia Jewelry tribe! See you next year! A beautiful jewel rocking her new "Commitment Issues" nose cuff! Thank you for stopping by love! The power puffs were a major hit! I loved this hairstyle. I felt powerful and playful! Shocked we are ready to go for Day 1. Even more excited for Day 2!! Soaking up some sun and recharging for Day 2? We see you queen! Michelle's excited for Day 2 can you tell! Dripping in Made by Malyia Jewelry! Show these beautiful people how you rock your Made by Malyia Jewelry Michelle! My nephew AJ and Sister Vanessa. "This liberating moment represented so much more than the act of removing years of damage it was a symbolic and represented a new phase of my life. I credit my natural hair journey for helping me discover a self-love I never experienced in the past." I had the opportunity to chat with Curl Riot about my natural hair journey. A blog that focuses on beauty and style tips for natural hair. I shared that my journey to natural hair inspired me in others area of my life and helped me to start Made by Malyia. Read the full blog HERE and visit them on IG/Twitter/FB @CurlRiot. It's been a while....April marks 4 months since I quit my 9-to-5 to become an entrepreneur and full time girl boss of Made by Malyia. A major factor for leaving my 9-to-5 was to have the ability to devote everything to bringing you the best product and service. I had no idea how demanding my schedule would become once word got out I had "free time". If you've been keeping up with the brand on social media you know I consider the brands evolution a journey. My goal is to inspire others with my journey by bringing you along for the ride. I started designing jewelry as an outlet and to create jewelry I didn't see on the market. Taking the leap was the scariest yet most liberating thing I've ever done!!! Read my blog feature HERE on The Stylish Standout for more details on what lead me to finally take the jump. In order to be provide full transparency I will say I have dealt with a new fear I hadn't encountered before. Everything requires sacrifice so this path is not for the faint of heart. 4 months later and it is still the best decision I've ever made. I have complete freedom to create the schedule I want and many days my schedule is fully booked. This flexibility has also brought new opportunities. I signed with Bicoastal Model Management two months ago thanks in large part to my feature on Vogue.com "The Best Street Style at Afropunk". I have also released a New Collection, had several blog/press features, and I am currently working on an image & fashion consulting firm with my sister launching this summer. I have also been sharing my journey as a speaker at several non-profits including women shelters. The universe has a way of bringing all the pieces together sometimes it is waiting on us to jump. You may discover all you've ever wanted was waiting for you at the bottom. Thank you for your continuous support of the brand! None of this would be possible without all my amazing jewels and gems. Check out the New Spring 2016 campaign and stay tuned for much more coming soon! Stay connected and follow the journey @madebymalyia-Instagram, Twitter,Snapchat (I'm a snapqueen), Pinterest, Tumblr,Facebook.